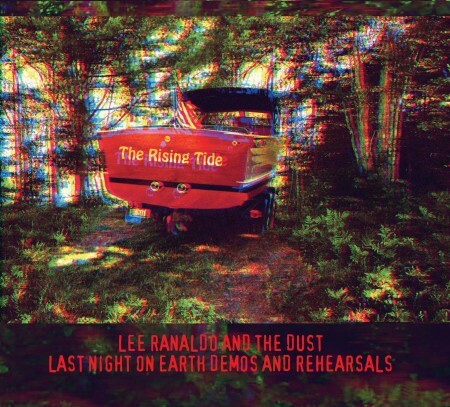 This set, with one solo acoustic disc and one disc with The Dust, contains various recordings of the developing material for the album Last Night On Earth. My interest in presenting them here – in some cases in multiple variations – has to do with the nature of much of this material, which began on acoustic guitars at home and, with The Dust’s help, developed in the studio as vehicles for instrumental interplay unlike those on Between The Times And The Tides. 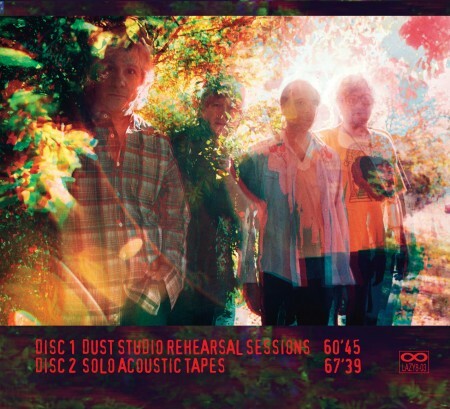 While the album itself collects ‘definitive’ recorded performances of these tunes, I found upon reviewing the work tapes that I enjoyed the variations present in many of these alternate takes – roads not taken, developmental stages – which accrued across many months of rehearsals in the studio. My hope is that these songs will continue to expand further in all sorts of ways as we play them live. In any case I hope you enjoy listening to them. 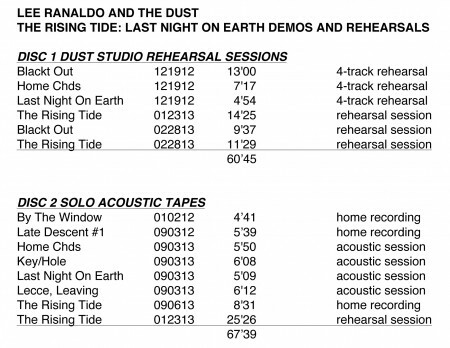 I’ll single out one track in particular: an instrumental band rehearsal of The Rising Tide (012313 – 25+ minutes) that closes the otherwise ‘solo acoustic discc’ – I consider this one of the finest things we ever recorded. This set is pressed in an edition of 1000 copies with the intent of being sold exclusively at live shows, although some copies are available at the SY web-store site, and at Matador’s site as well. 081213 | Filed under BLOG. Please introduce me to a CD (not tape) of your choice (should you find the time and care to) which will represent a good (say feel) of your work you would like a naive (at 50 years old) to hear please. Think a UK listener, Steve Hillage, Gong, Hawkwind etc over here in the late 70’s to early (and precisely) New Year 1981 (I think?). Then a glitch until 91 and the discovered everything of the reason for a glitch. Vague I know, but so is anything of Sonic Youth etc and all. Yet I am very curious and like the say, (essence of and) approach of the members work since as I am finding online etc since I did look to know such. Take your time, no rush and any time you suggest, I’ll buy it. Well, you know…Not a back catalogue or anything. Yet your open suggestion. Outa here and I consciously don’t fuss no one. You’re safe.